HEART OF CHARNWOOD: A Finish and Fresh Sewing Day. I have finished the pouches (bleurgh) that I've been working on for the Pretty Little Pouch Swap, and I'm rather pleased with them, although there was a little bit of (pardon my french) fannying to get to this point! It is always tough when the person does not give much feedback, but I went with the hints about their style, and checked out her blog, which left me with some ideas. 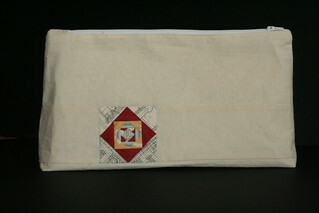 On the front of the main pouch, lets call it a zippy bag, is a feather using Anna Maria Horners pattern (but reduced down considerably), with some handstitching, and for the back I made a paper pieced, mini square in square block. The fabric is Sweetwater, and the cool earthy colours will hopefully be right up my partners street (fingers crossed). I also made one of the little Scrapppy Pouches from Katy Jones tutorial on Sizzix this week, and I can confirm that it does indeed take about 30 minutes, which is unusual for me, as usually a so- called 30 minute job is more like 2 hours! I also managed to fit in a couple of new blocks yesterday for the Pile O' Fabric Skill Builder BOM, which was fun, I really enjoy working with solids (sorry Hadley! ), and these feel pretty bold, I rather like them. 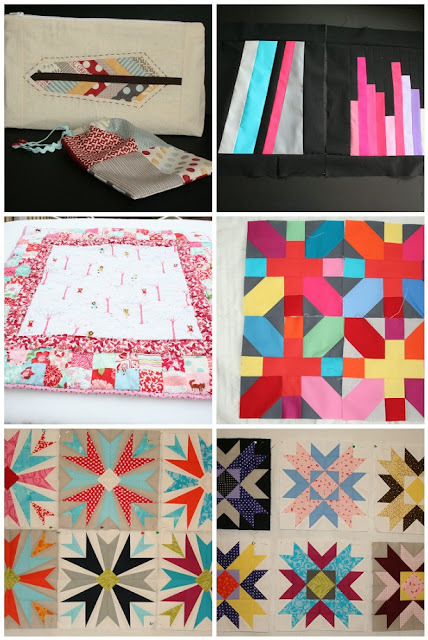 And so, as a quick round-up of January, I'm joining Lynne's Fresh Sewing Day, and I need to re-do my list for the new month. I felt like I had done way more than this, but then I guess there are 18 blocks there, lots paper pieced and with a lot of prep, not much I can do about it now, it's a new month, lets start afresh! If your partner doesn't like the zippy, you can always send it to me! I think it's amazing!! You've made some gorgeous projects in January! Amazing feather zippy pouch - love it!! And wow - amazing collection of completed blocks too! That looks like a lot to me - I see what you mean about the similarity to my month. And I love the cheeky wee block on the back of your zippy, stylish! 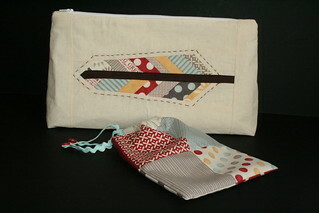 Gorgeous pouch,and I love those solids blocks. Your mini feather is too cute. And I love the colour choices for the BOM. It really suits those striking solids against the black. I adore your feather zippy, I downloaded that pattern but haven't gotten around to making one of those feathers, maybe this week! Love how the zip bag turned out and the blocks look like a lot of work, you've been busy this month. That pouch with the feather is adorable! 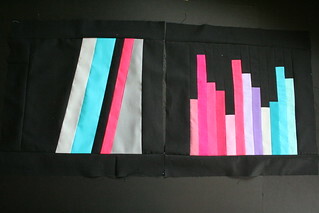 And I'm loving your use of solids on your Skill Builder blocks! Looks like a lot to me! Beautiful feather too, I so want to make some of those!